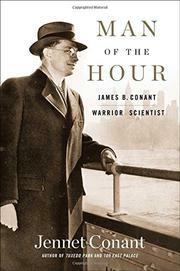 James Conant (1893-1978) is only moderately well-known because, ironically, he accomplished not one but many things. He deserves better, and he receives it from his granddaughter, Jennet Conant (A Covert Affair: Julia Child and Paul Child in the OSS, 2011, etc. ), a skilled historian. A quintessential New Englander (he possessed a “cold, clear-eyed Yankee pragmatism”) and superb student, Conant excelled in private school and at Harvard, where he received a doctorate in chemistry in 1916. He was an exceptional researcher, rising to become chairman of the chemistry department in 1931 and president of the university in 1933. He was a vigorous, controversial reformer, abolishing Latin requirements and athletic scholarships and allowing women to attend Harvard medical and law schools. Appointed head of the National Defense Research Committee in 1940, Conant spent the war administrating massive scientific programs, most importantly the Manhattan project. After 1945, he remained a top adviser. He declined the position of High Commissioner of Germany in 1951 but accepted in 1953 and became the first ambassador to West Germany. Conant was a brilliant chemist, an outstanding college president, a talented administrator, and an accomplished diplomat, but he was not charismatic, eccentric, or ahead of his time. Generally liberal, he had no objection to Harvard’s Jewish quota or firing teachers who invoked the Fifth Amendment. He is well-served by the 500 pages of his granddaughter’s intensely researched, insightful, and rarely dull biography. Conant deserves a place among the traditional “wise men” (Acheson, Harriman et al. ), an elite group of white, male, East Coast advisers, all pragmatic, realistic, and nonideological, who guided presidential policy from World War II through the end of the Cold War. This book gives him that place.